Eight Oakland youth and three teaching artists brought their minds and hearts together to make-believe a new creative writing space for the Oakland community. Led by Workshop Coordinator Rei Jackler and Writer-in-Residence Margaret Miller, the workshop spanned one week and guided the youth in writing and design activities. The youth examined what makes Oakland Oakland and created prototypes to help plan the Chapter 510 writing space. Their results … incredible. Their writing and photos were compiled overnight into a zine, titled Strictly Oakland: How Many Oakland Youth Does it Take To Make a Writing Center. Download and read their zine here! Under the instruction of teaching artist Perla Yasmeen Meléndez, Acorn Elementary second graders practiced their bookmaking skills and completed an amazing creative writing project. Inspired by Pablo Neruda’s Book of Questions, the children posed their own unanswerable questions. From “Where’s the Taco Truck?” to “Why does my mom let me go to parties?”, the collection of questions peeks into the growing critical minds of the young writers. The work focuses, too, on the class’s discussion of migration and its role within a family. The students recorded their family’s personal migration histories alongside the migration tales of some of their favorite animals. The students showed their work next door to the Acorn campus at the 81st Avenue Branch of the Oakland Public Library. The exhibit allowed participants to walk through a maze of questions, stories and beautiful artwork. Nourishing the stomachs and souls of the Oakland community with Poetry...and Pizza! In celebration of National Poetry Month, Chapter 510 teamed up with sister organization Big Class to publish youth poems from NOLA on some of the best boxes of pizza in the East Bay, including Emilia’s, Slicer and Lanesplitter on Temescal. We don’t know if we’d eat “a wild pizza dough [with] Elephants stuck on top of it,” but we certainly want to read about it! It began in fall 2014, when Chapter 510 volunteers mentored twenty ninth grade students at Oakland’s MetWest High School. Every semester since then, we’ve added new classes to our roster, and today we are helping six classes of students write essays, finish their homework, and apply to college. Chewy, Gooey, Sticky, Doughy Poetry! If you’ve ever made bread, you know yeast is not about to be bossed around. NOCCS K/1 students baked bread and figured this universal truth out, too! On top of that, they wrote a book of poems about it! Who isn’t inspired by the Harlem Renaissance? 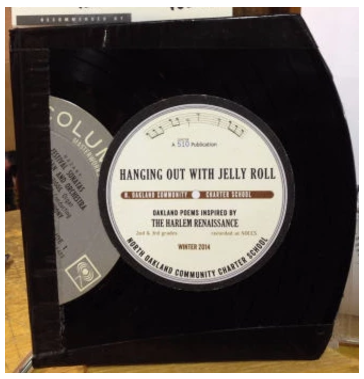 This handmade, recycled LP cover collection of poems by 2nd grade students at NOCCS in North Oakland celebrates the sights and sounds of the Harlem Renaissance jazz scene. Scratch 510 was a hands-on intensive DJ summer camp focused on turntablism, composing, beats, scratching, and the history of DJing. Led by local DJ legends Max Kane and Ladyfingaz, youth listened, scratched, sang, recorded and it came out dope. 510 Journal is a series of posters displayed in public places throughout Oakland, including schools, businesses and transit. The first issue of 510 Journal answers the question: What does a poet look like? In partnership with the Oakland Public Library, the project features the work of the 2012 and 2013 Oakland Youth Poet Laureates Sophie Elkin, Stephanie Yun, Obasi Davis, Francesca Paris and Olivia Hoffman. If you haven’t seen them yet, 510 Journal can still be found online and at Rock Paper Scissors Collective.